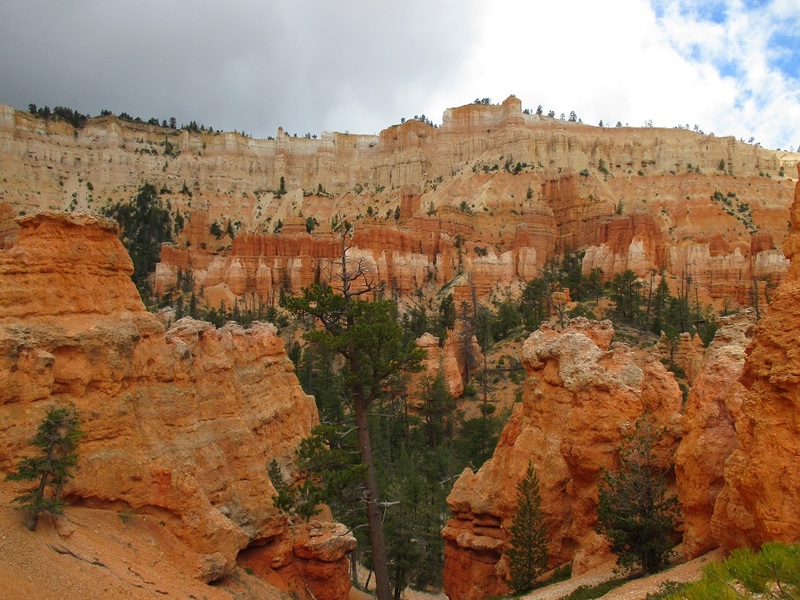 “Well Bryce, it’s been a slice,” is what Tom and I said to each other as we left Bryce Canyon National Park. 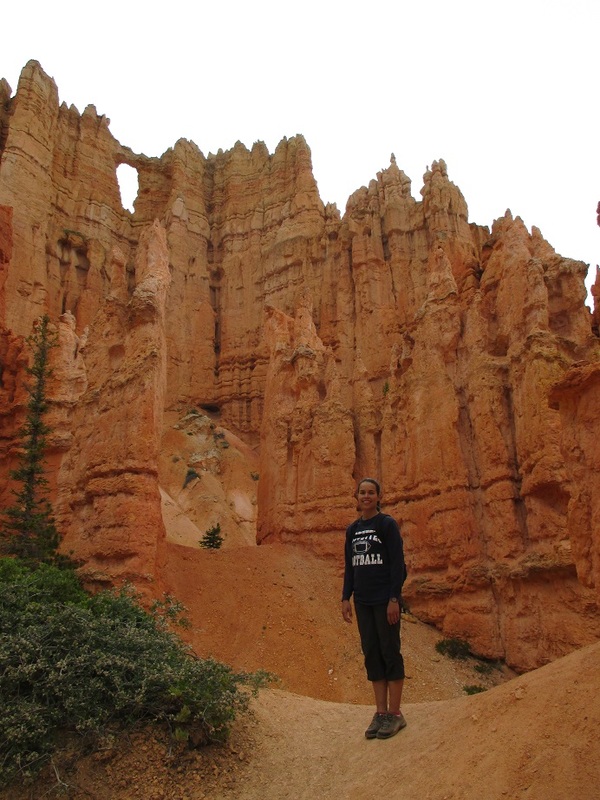 We enjoyed our two-day adventure in the canyon, hiking the Navajo/Queen’s Garden/Peekaboo Loop day one, and the Fairyland Loop day two. 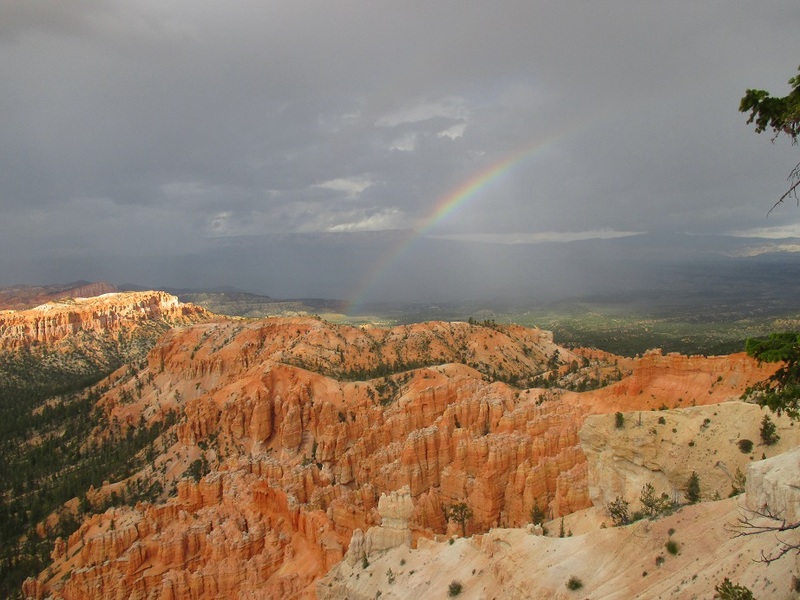 We explored the different viewpoints by car, and saw a double rainbow at Rainbow Point. 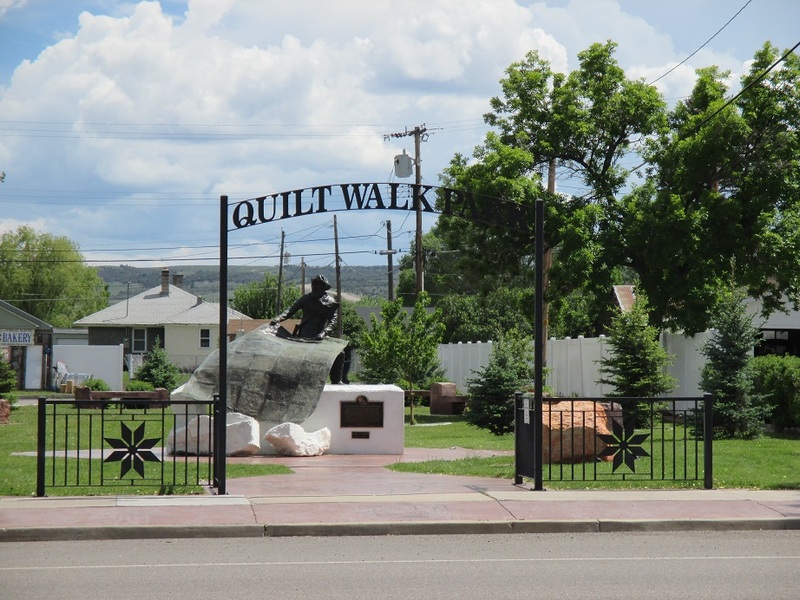 The town of Panguitch got a visit from us because of the infamous Quilt-Walk Festival that takes place the second week of June. I was amused by the sound of this festival, even though I have no idea how to quilt; and, it was definitely an amusing experience. Back in the late 1800s the town of Panguitch experienced a winter harsher than what they were prepared for, leaving them without enough food and supplies to get through the winter. Seven men were sent by foot to the next town to get supplies, but soon were helpless in the midst of the snow drifts and deep fields of snow. They stopped to pray on their quilts, and when they got up they noticed that they did not sink in the snow while they were on them. 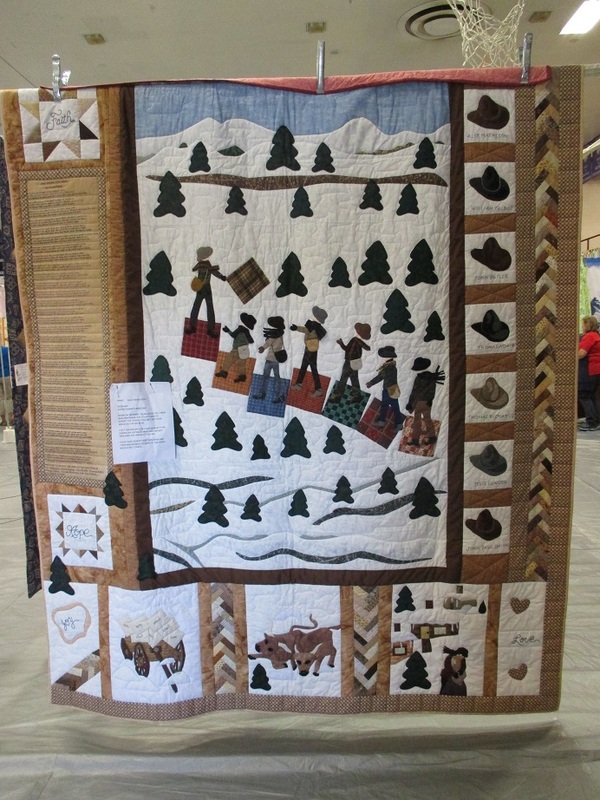 So, they walked to the next town on their quilts and saved Panguitch from starvation. Every year the town celebrates these heros with a 4-day festival. 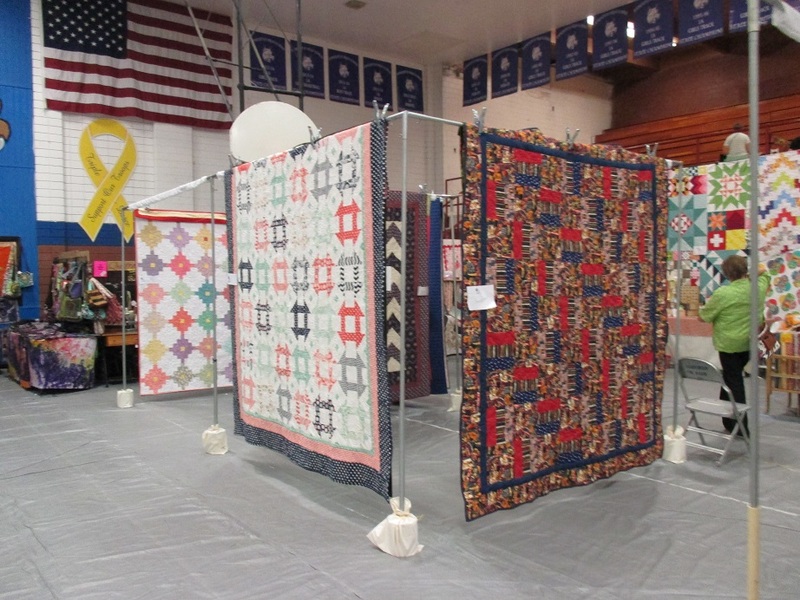 The first thing we did was check out the Quilt Show at the local high school, where we saw beautiful hand-make quilts, and vendors who were selling all kinds of quilting equipment. We noticed very quickly that we were younger than most of the people there by about 40 years. We went on what was advertised as the Quilt Walk (hey, I thought I’d see people walking on quilts! ), but it was a walking tour. 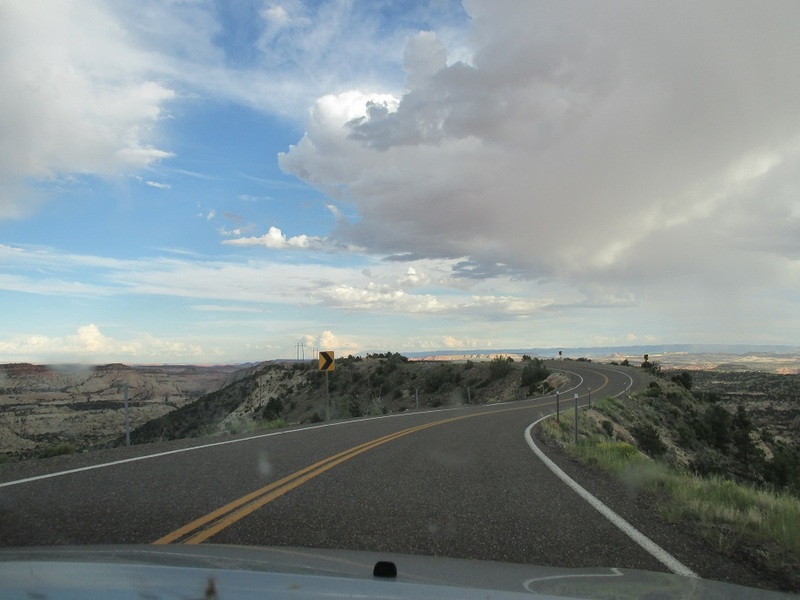 The tour guide was a former mayor of Panguitch, now in his late 70s, and he knew a lot about the town. At first it was interesting to learn about the locally-made red bricks that were used as currency back in the day, which is why there are so may red-brick buildings in the town; but, the tour got boring when he described many details about every building in the downtown area. Tom and I left feeling perplexed by the experience. The next day we attended the pancake breakfast – all-you-can-eat for $6 – yum. 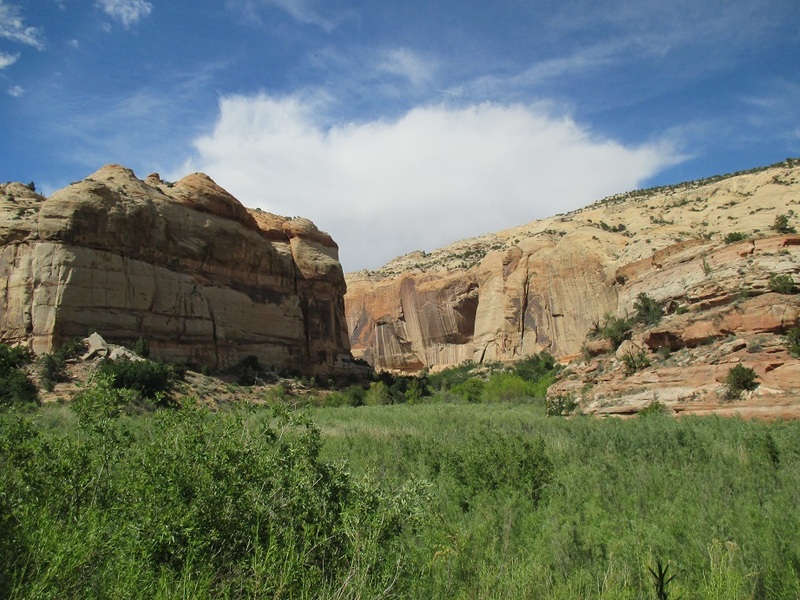 Our next stop was Grande-Staircase Escalante National Park. Unfortunately, due to recent rains, one of the places we wanted to go was in poor condition. 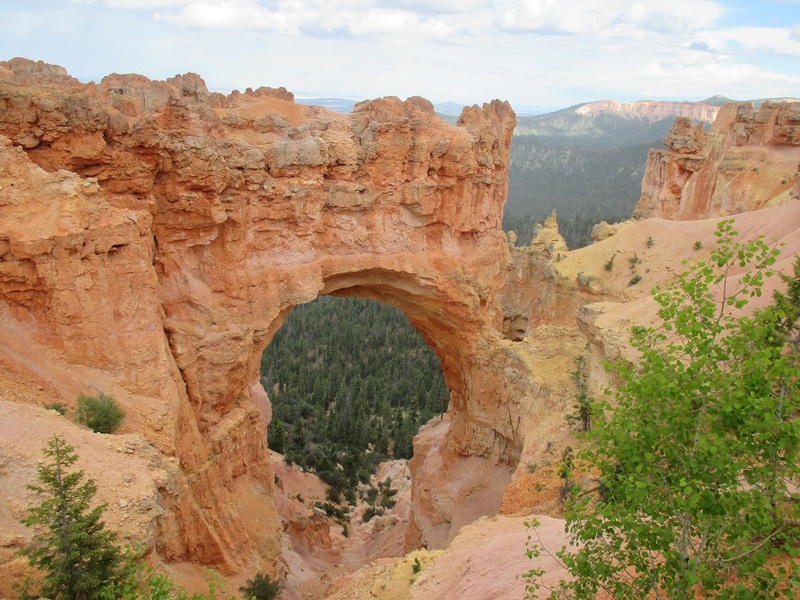 (We had already been faced with this a few days prior, in Kanab; we sadly had to forego hiking the Wave, and went to Bryce earlier than planned.) 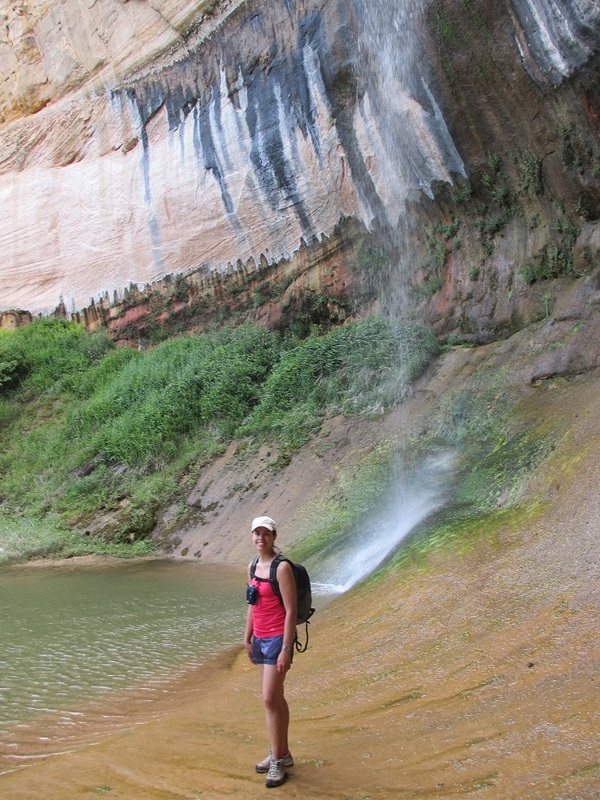 Rather than dwelling on the hikes we could not do in Escalante, we decided to hike Lower and Upper Calf Creek Falls. They were both easy and beautiful. 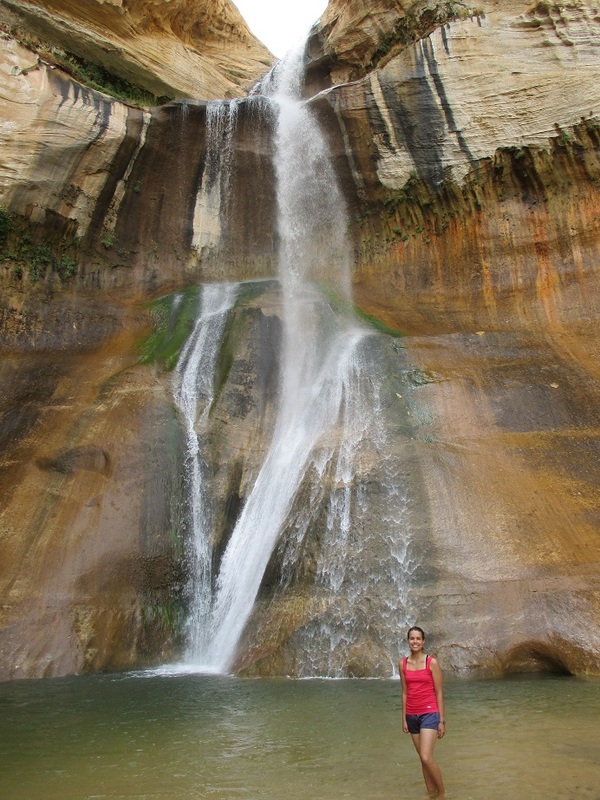 I was hoping to swim beside the falls, but the water was very cold – around 50*F.
The next day, we hiked Phipps Wash. There was no trail for the majority of it, but rather, we followed a mostly dry river, navigating around dry falls and water holes. We had to bushwhack in a swampy area, and at times unexpectedly sunk ankle-deep (and a couple times knee-deep) into wet sand. 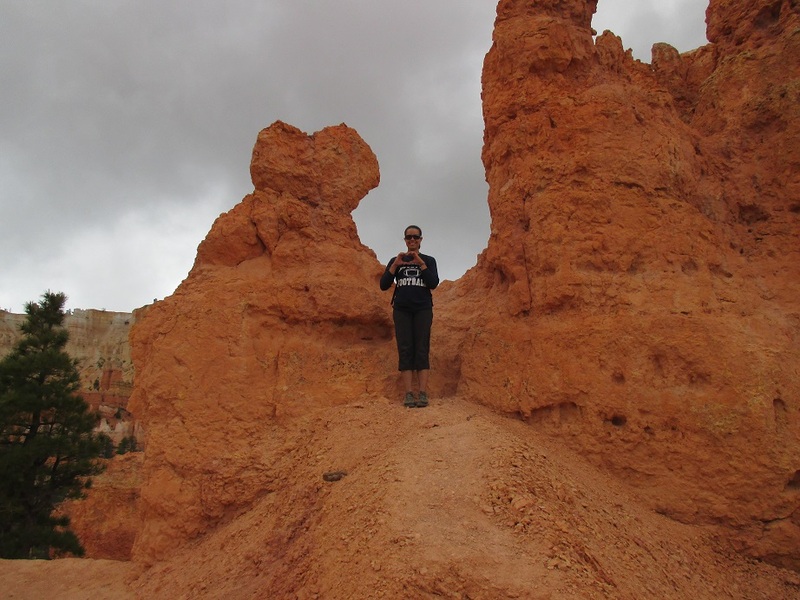 We got off-trail a few times and had to consult our GPS. 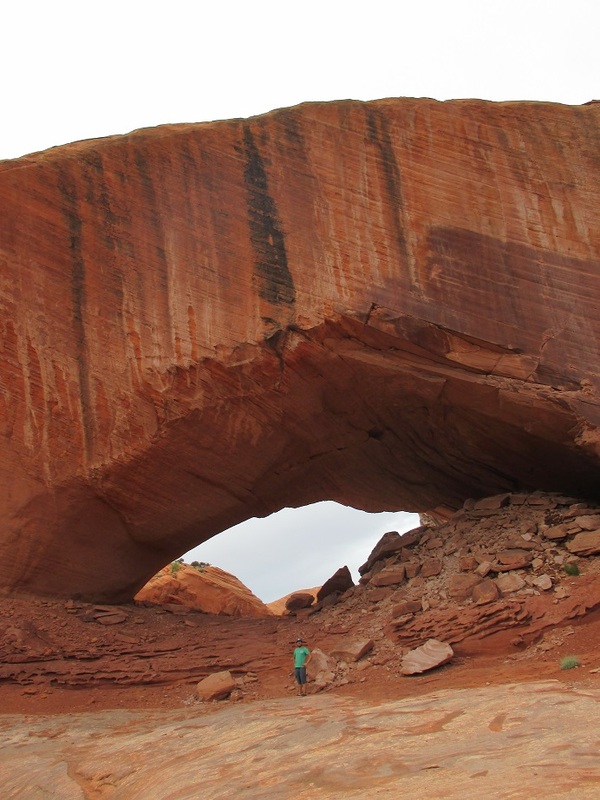 The end result was incredible – Phipps Arch. After getting off-route for most of the way back to the car, we agreed that the hike had been fun, but less so because of the ambiguity of the trail described in our guidebook; a 3-4 hour hike turned into a 6-hour hike. 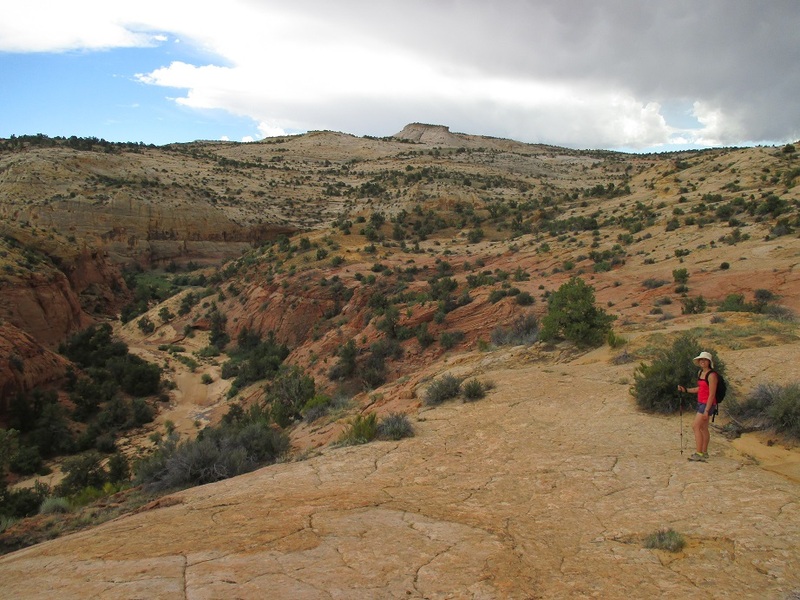 Escalante NP is great – free camping, less touristy than other parks, and beautiful. 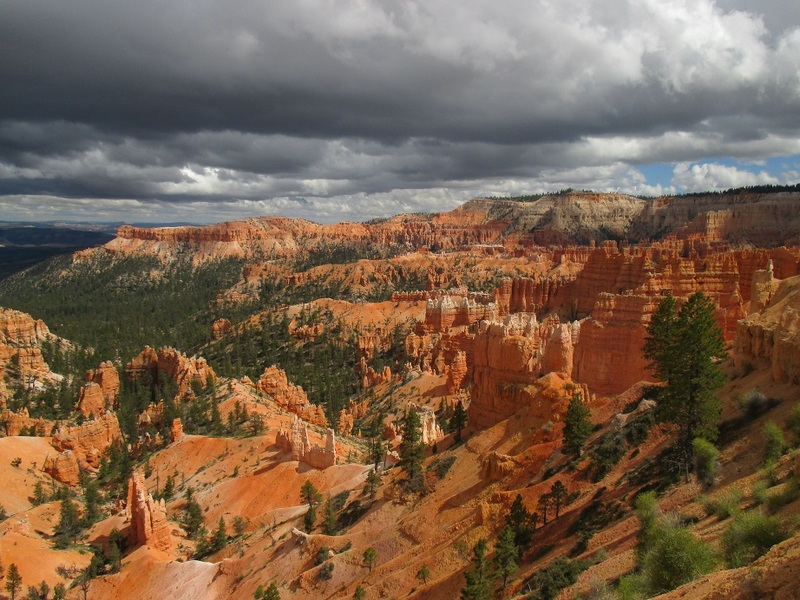 Fingers crossed that the washed-out roads to Peek-a-boo and Spooky Gulch are better today. 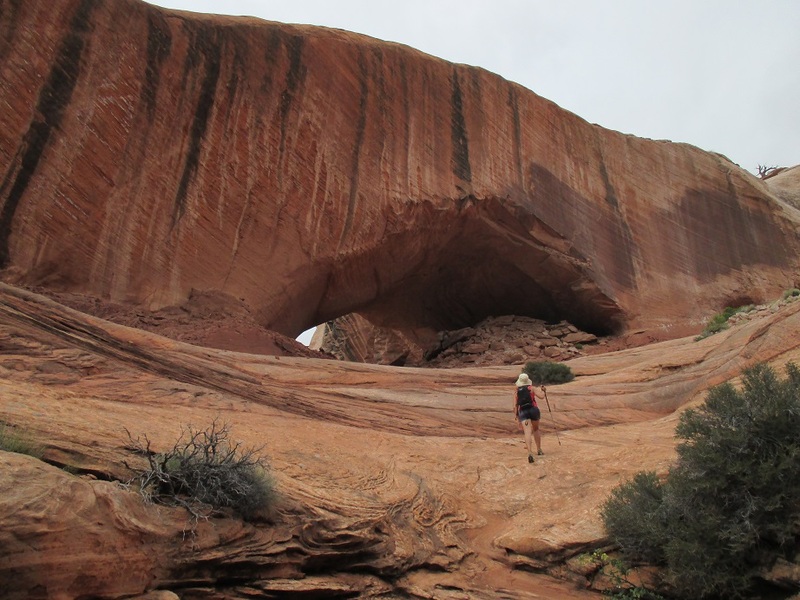 If we can’t hike there, we may move on to our next destination – Capital Reef National Park. 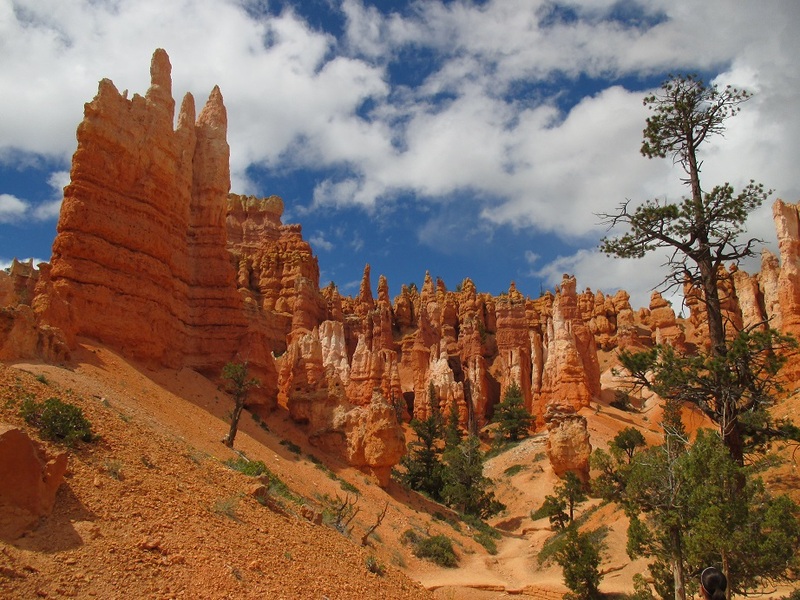 I’d heard Bryce Canyon is amazing. Now you and Tom have confirmed it. Looking forward to your next posting.